Urban Muser: A Knitting Oxymoron? Thanks to some major inspiration from my fellow knitters on Ravelry, I have been really into knitting fingerless gloves in the past 6 months or so. I know some people don't think they are actually gloves if they don't have fingers, but my friends who receive them as gifts don't seem to mind. 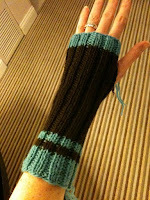 I have a friend who has juvenile rheumatoid arthritis and she found the gloves to be very useful to her. She wrote an article about the gloves in her blog. It was great to see my knitting have such an effect on someone's life. I am working on this pair right now--they're for my friend's birthday in April.